Instagram, Snapchat, Facebook, YouTube, LinkedIn, Pinterest, Twitter, Tumblr, Blogger… you name it! There are more social media channels than we know what to do with. It’s difficult to keep up with the latest tools, tricks and trends (and even more time consuming to create and post content and track the effectiveness of it all). 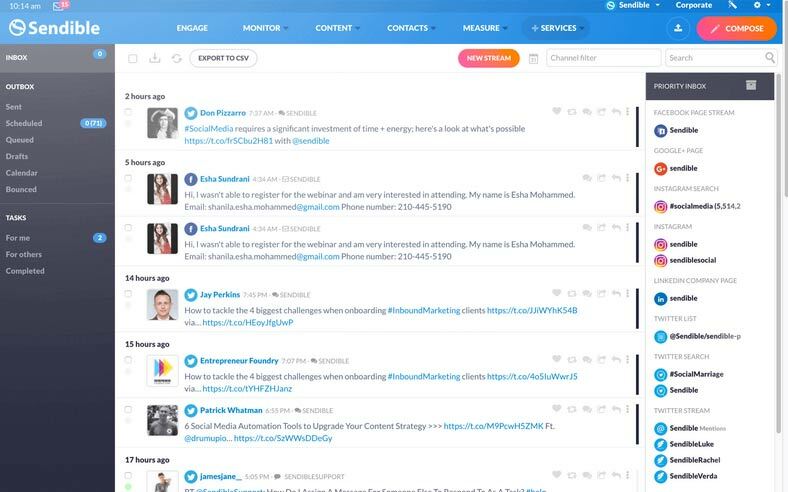 Enter: social media monitoring tools to help you get the job done. Social media analytics tools offer a one stop place to post, analyze and schedule all of your social media efforts, alleviating the pain of having to log in and out of dozens of accounts and websites regularly. They use APIs (or Application Open Interfaces) that allow external software programs to pull in already existing data. This gives these social media monitoring tools the ability to integrate with the various third-party sites. Because Facebook and Twitter have been around awhile, they are pretty standard in most businesses marketing channels and thus they have lots of API capabilities. More image focused sites like Pinterest and Instagram are also included with many services when it comes to providing full operational and reporting features too. Why Do You Need Social Media Tools? It’s not news that social media usage is growing. As a result, more brands and businesses are getting on the bandwagon to try to join the conversation, customer interaction and business building. But with so many sites to manage, how do you keep up with it all? Whether you are a social media manager for multiple businesses or running a company, social media scheduling tools help make your job easier by killing two (or ten) birds with one stone (please pardon the pun Twitter 😉 ). We’ll help you find the best tools on the market, the benefits of each, the pros, the cons and pricing to determine which is the best solution for your business needs. Most services offer similar features with slightly different social media dashboards and methods of using them so for that reason it was a challenge picking a winner. Each tool seems to excel in one particular area which we’ve noted below. We feel confident that our top three all do a solid job of helping you manage your social media marketing and give you a variety of features for an affordable price. In doing research and testing out some of the newer players, we found there are a variety of tools and plans available to suit the needs businesses of all sizes. Whether you are doing social media as a hobby for your blog or have a large brand with hundreds of fans, there could be a social media tool that is better suited to your needs, budget and preferences. Hootsuite wins our top spot because it integrates with so many services, is affordable and has adapted to the changing social media landscape with grace and expertise. Started in 2008, Hootsuite is one of the oldest and probably most widely known social media tool. While several Hootsuite competitors have popped up over the years, it still can’t be beat. Its robust social sharing and dashboard allow you to customize streams for each profile or channel. You can also create as many tabs as you need to organize in the way that works best for your business. This tool allows you to target posts, add a location, customize privacy, and bulk upload up to 350 posts from Excel. If you have multiple accounts linked, then you can star your favorites or “pin” it to always post to that channel. Use the URL-shortening tool to create trackable links. If you are posting to Facebook, you can select the thumbnail image, edit preview text and see how it will look before posting. You can save content to drafts and use the auto-scheduler to post when it gets optimal impact and visibility. While the statistics are pretty basic, you can create and export custom reports and set up email notifications. One downside we found frustrating is when composing Tweets, it will not auto-populate suggested handles. Hootsuite is a solid option (and free for the basic plan) for users of all experience levels. Note: All pricing based on annual plans. SEMrush has been a popular tool for tracking SEO efforts for years (it’s our top pick for the best overall SEO Tool), but we just learned that it also has a social media tool built-in! As avid users of SEMrush, we were pleasantly surprised to find the capability to publish social media posts, track performance and report via a helpful dashboard within a tool that we were already paying for! It puts all content efforts under one roof for a competitive price. Since SEMrush is known for its SEO and not social media, we were a bit skeptical at first. But, we connected our profiles and took it for a spin to see if we liked it more than our current social media tool. And boy, were we impressed. 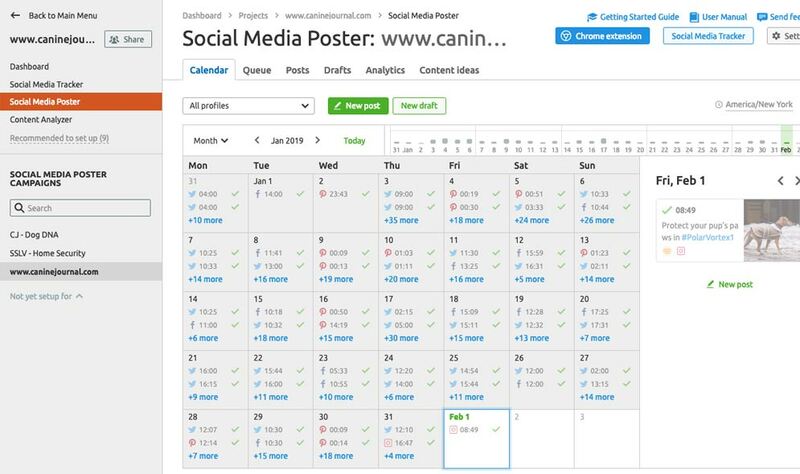 You can see all your posts in a calendar format, it shows a preview of the post on the various channels and also helps you determine the best time to publish. With all of these capabilities paired with a top-notch SEO tool, we moved SEMrush into our top 3 picks for social media management as well. We wish we’d discovered the tracking tool sooner as it would have saved us time putting together manual reports over the years. Not only does it show stats per channel and increases in fan base, engagement, etc., you can also compare to the previous month’s performance. It also syncs with Google Analytics to show which posts are driving the most traffic to your website. The only flaw is that it does not currently offer Instagram posting from its social posting tool. You can draft up the post to preview and add it your calendar, but it only sends you a reminder to post it manually (or we use Buffer’s free version). Our readers have access to an exclusive 14 day free trial for SEMrush Pro! Just use this link to get started. Newer to the social scene is eClincher. Much like Sprout Social and Hootsuite, eClincher is an all-in-one publishing, social inbox and analytics tool. It’s also user-friendly with features that make scheduling and reporting easy. You can do things like sort your tweets by best performing, see a calendar or list of your upcoming posts and schedule posts to repeat daily or weekly. Its analytics dashboard is pretty basic (not more than you might see from logging into Facebook or Twitter’s insights), but it gives you a snapshot to see how things are performing all in one place. While e Clincher does offer an affordable plan, the Inbox and other features like Google Analytics will cost you extra. However, it’s still a good value for the price. One feature we loved about eClincher, which sets it apart from the rest, is its integration with Canva (the popular social media graphic creation service). With Canva you can create custom branded images right inside eCllincher’s interface with ease. eClincher also has more social profiles than any other social media service we reviewed, which is a big plus if you’re active on many different channels. All eClincher plans come with a 14-day free trial. In addition to our top three picks above, there are many additional social media management tools on the market to consider. Below, you’ll find an alphabetical listing of other popular social media managers we’ve reviewed. Click on the link to jump straight to the review or scroll down to read them all. AgoraPulse is a visually appealing social media manager for Facebook, Twitter and Instagram. Setting it up is easy as Agora walks you through linking your accounts with step-by-step instructions on how to use each feature. Each platform has an individual dashboard with a snapshot of stats, upcoming posts and items to review. You can even dive deeper into each area if you wish. We appreciate how each platform is compartmentalized into its own area, making it easy to toggle among social media channels. Some of the other tools can be confusing when they intermix the networks on one dashboard. However, one downside to that is you can only publish content to one channel at a time. 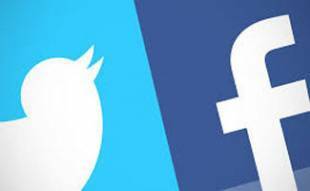 So if you are looking to push a post out to Twitter and Facebook simultaneously, you’re out of luck. Same goes for posting to multiple Twitter or Facebook accounts at once. One added benefit to AgoraPulse is the ability to install a number of apps and run Facebook promotions. Agora Pulse is a good option If you are a visual person with only one brand to monitor/publish. Learn more about AgoraPulse from our interview with their CEO, Emeric Ernoult. AgoraPulse has a limited 15-day free trial (Facebook campaigns are limited to 20 participants). 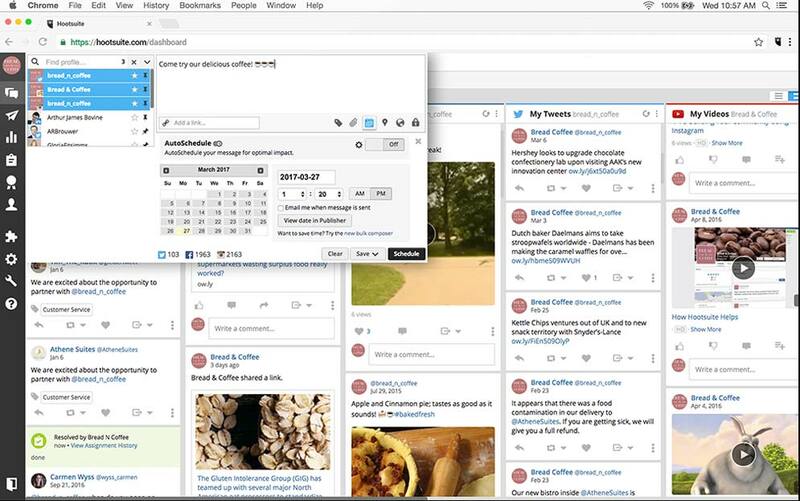 Relatively new to the social media scene, but quickly gaining popularity, is BufferApp. Their Dashboard is white and extremely clean, making it difficult to get distracted when writing posts or to become overwhelmed with data during analysis. You can enable campaign tracking via Google Analytics’ UTM parameters and install browser plug-ins to easily share content from the web. There aren’t many stats or analytics, and the free version is pretty limited. If you’re looking to monitor conversations or interact with users, Buffer probably isn’t the best app for that. Buffer is intended to auto-broadcast your messages across social media and schedule a backlog of content. Buffer has a free trial for paid plans. Sendible is a social media management tool that has CRM functionality. It pulls in your posts and comments across all channels and allows you to respond from one place. You can even highlight items requiring urgent attention. Like many other social media managers, you can use custom reports to see how effective each post is and to queue up and optimize posts. All of the reports are displayed in a nice color coded calendar format which gives you a holistic view of your publishing schedule. Another nice feature is Sendible’s RSS Auto Posting, which publishes new, relevant content from your blog or site to your channels at regular intervals throughout the day. 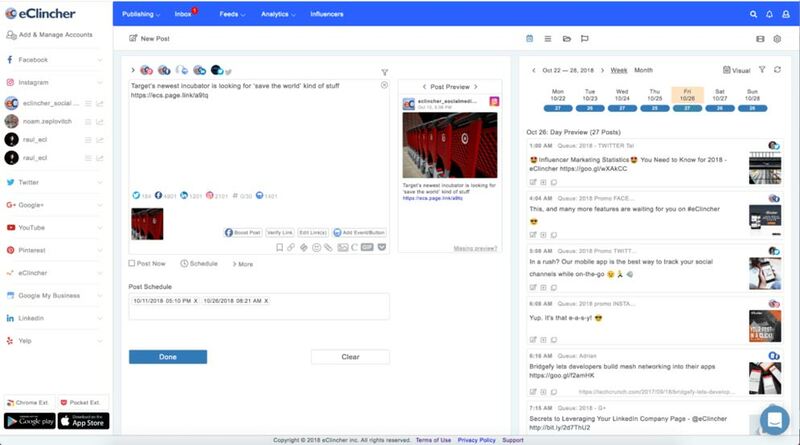 Founded in 2017, Social Aider is an affordable social media management tool with one flat price for unlimited accounts and projects. It has two plans and the only difference between them is the number of posts per month. Both plans have several impressive features including one-click to delete the same post from all profiles and platforms, video uploader tool, image editor, discovery to find hashtags and content, and more. There’s no free trial, but for the low price, it might be worth a try. Social Champ offers four paid plans (+1 free) based on your number of profiles and how often you post. 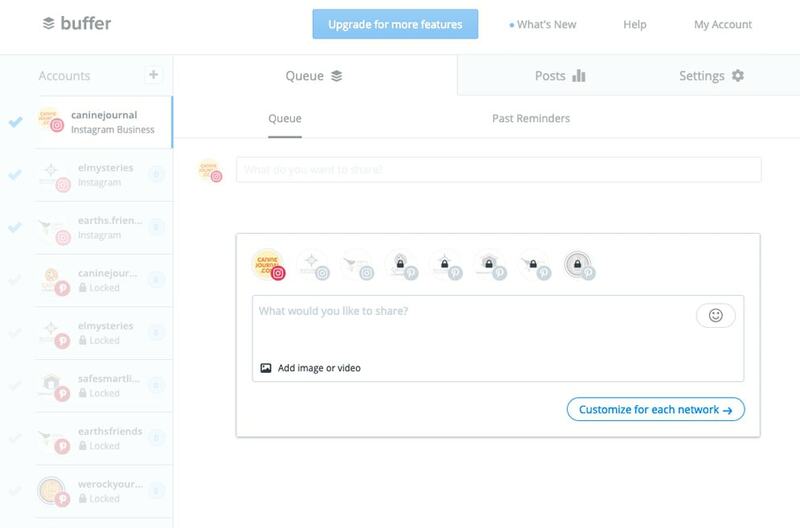 All plans come with a repeat post feature, auto-post when a blog post goes live via RSS, the ability to export analytics, link shortening via Bit.ly, content suggestions, calendar, video uploader and more. One feature that sets them apart is the drag and drop calendar for scheduling. Founded in 2010, Sprout Social’s easy to use interface is straightforward and intuitive. You can schedule, monitor and analyze all in one spot. Unlike the other tools which just serve up stats, Sprout Social takes it one step further by analyzing them for you. The analytics provide useful data like engagement percentage and how your social channels are trending over time with colorful charts, graphs and other visually appealing data formats that make it easy to digest and report back to your peers so you can be sure you are optimizing your social media networks fully. Sprout Social also allows you to sort through all your messages from all platforms (i.e. notifications of new followers, comments, replies, etc.) all in one spot. You can skim through the list to reply, mark as complete or flag as a task for future follow-up. You can even categorize items as a potential sales lead or customer support issue and give it a high priority. Another great feature is the Queue which gives you the option to load a backlog of content to post at pre-scheduled times (versus selecting a date for each one individually). The major downside is that you can’t interact as much with your fans and the monthly fee is quite expensive relative to the others, winning them a close second in our comparison. 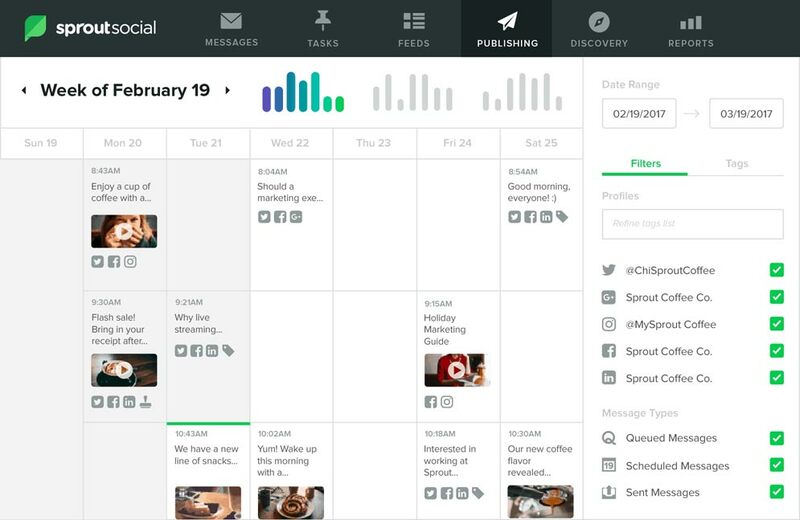 Sprout Social offers a 30-day free trial for all of its plans. TweetDeck (owned by Twitter) is free and allows you to post Tweets and track Twitter conversations, replies, hashtags, etc. It can be used as a downloadable application or via a web browser. You can connect an unlimited number of accounts for free (no paid version). You can schedule posts and set up desktop notifications when someone replies. 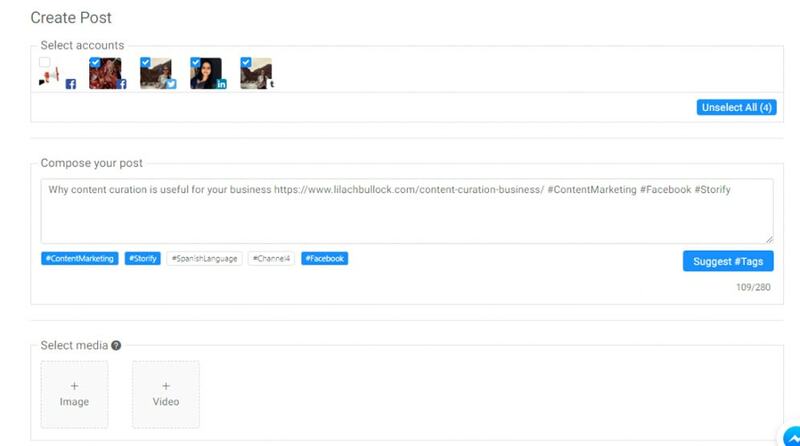 Sign up for TweetDeck with your existing Twitter account log in info and you can add columns to see conversations in real-time. 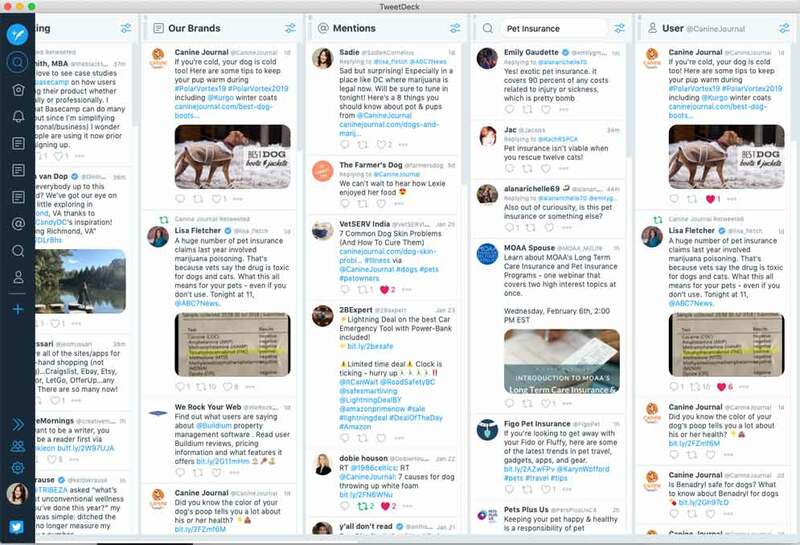 Tweet Deck is good to have in addition to other social media managers to monitor Twitter throughout the day. It is a great fit for anyone who manages multiple Twitter accounts, especially if Twitter is at the core of your social media marketing plans. Unlike other social media managers, this tool only allows you to manage Twitter. Social media advertising is an affordable marketing platform for any small business to get started. 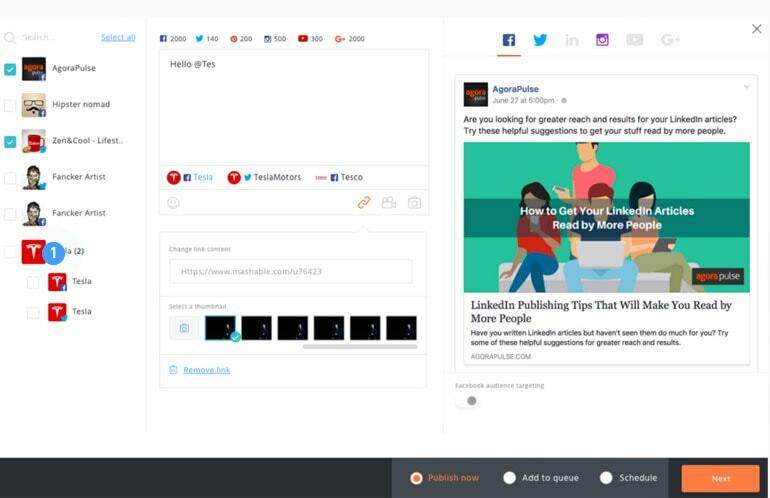 These social media marketing tools can help you manage your content across platforms, but if you don’t know how to advertise and promote on the social networks effectively, you’ll be wasting your time and money. Watch this short 3 minute video for 5 steps to social media advertising success. Which Social Media Manager Is Best For Your Needs? Many social media managers and small businesses find themselves struggling to find the one ultimate social media monitoring tool that can successfully manage all their social media efforts in one place. So, hopefully you’ve learned a little something from our social media management tools comparison. However, while there are several solutions, there is no one size fits all product for all since it all depends on your type of business, management circumstances, company policy, and budget. The best advice for anyone looking to try social media management software is to try before you buy. And, as the number of channels continues to grow and change, so will the number of services and types of features. Some applications are used more for monitoring and responding to comments, mentions and messages, whereas some have a full reporting social media dashboard to help you analyze trends. Many programs are a hybrid of the two, and some even include the ability to schedule posts for multiple channels at once. Get your feet wet, test the waters to see which social media analytics tools work best for you and your team, and find a system that meets your specific needs and preferences. And if you’re looking to learn more, read how to build your business using social media article. What social media tool do you find most useful and why? What does “Can only connect one service to one Hootsuite account at a time” mean? KAW, for instance if you already have a Facebook page connected to a Hootsuite account, it can only be “owned” by that Hootsuite user. If you try and connect that same page with another Hootsuite account you’ll take over the ownership with that Hootsuite user and the original account will loose ownership of management of that page. Does that help hopefully? Without a doubt, social media is where hungry markets lies, and with the right targeting of audience, good results are guaranteed. Of all these social media monitoring tools listed, I use Hootsuite but I think the pricing has scaled up and is no more as stated above. Thanks Sandra, we’ll take a look at Hootsuite’s pricing and update it accordingly. Great post on social management tool. Can you review SocialChamp too? We give two creative options to repeat and recycle content. We will consider adding SocialChamp to our review in our next audit. We will consider adding HeyOrca in our next audit. We’d love to be reviewed as well! MeetEdgar is a little different than the rest as we automatically share and re-share a library of your content. We will consider adding it in our next audit. And perhaps honourable mention of Zoho Social as well. Everypost.me – is not even mentioned? Great post! Recently my favorite apps (and most useful) are ToDoist – for planning my tasks; Click Meeting for my video conferences; SmartClothed for my styling (it’s a new app and it’s really functional and easy to use, I love it); Sprout social for my social media accounts, it’s a bit expensive but it’s worth it. Good detailed post. Nice to see the pro’s and con’s set out so clearly. Thanks for an interesting review. It’s amazing how many different ways these different products can appeal to folk. Often there is one killer function one can not do without, or something one just can’t stand. Must admit, have gone back to Tweetdeck and Hootsuite several times but just can’t deal with the busy-ness of it. Do like the Social Sprout aspect, where one can process inbox, searches, mentions, messages etc – this way it’s easy to keep up. If can’t answer at the time, time to forget if I’m just working from the mobile alone. Looking at trying social report next, but at this stage think it will be Sprout Social as I find it just fits in with what I need, and how I work. Cheers though for all the content…. PS Check the two logos in positions one and two, looks like HS is mixed up with SS. Thanks for notifying us of the logo mixup. We will be sure to correct that! Thanks for this. 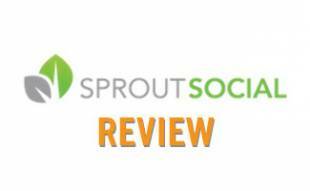 You do know that the logos are reversed for the Hootsuite and sprout social reviews, right? Thank you for bringing this to our attention. We will be sure to update that! Hey Sadie, great post, very comprehensive and valuable insights! And thanks for including Agorapulse in the mix, I appreciate! Maybe be 2 cons you may want to reconsider: we do offer a mobile app (iOS and Android) and we do offer the ability to assign tasks to other team members. Happy to chat about this and see how we can help you. On the publishing side, you’re right, publishing on multiple accounts is a must have, and it’s coming very soon! Thanks for the information! We will be sure to make those changes! Hey Emeric, thanks for reading and for creating such a great tool for social media managers to use! We’ve updated the cons so they accurately reflect the product, appreciate the feedback to help ensure the review is as up to date as possible! Very comprehensive post, and very informative too, great work! And thanks for including Agorapulse in the list. Two cons that you should update: Agorapulse offers a mobile app (iOS and Android) and offers the ability to assign tasks to team members. Happy to chat about this and see how I can help you! Thanks for mentioning these corrections to us! We will be sure to update the post!